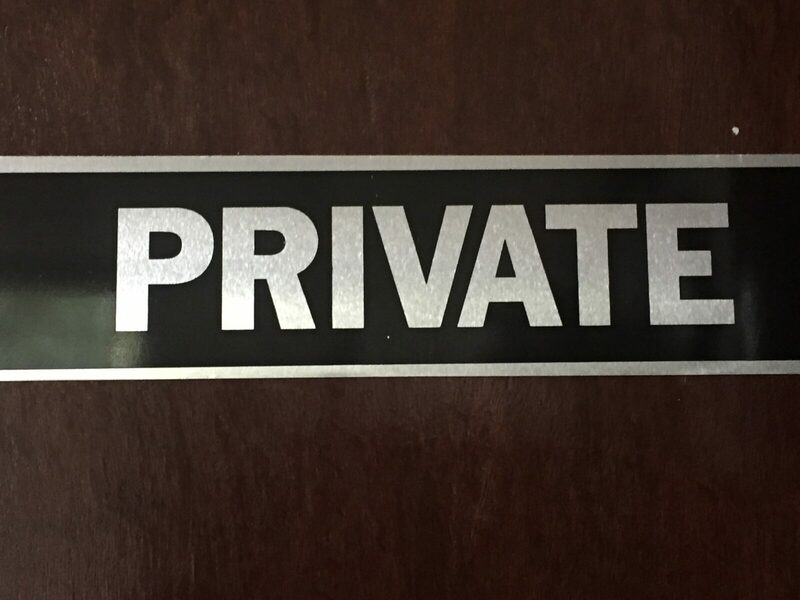 What does private mean to most people? Does it mean something is truly private financially? Does it mean a person is reserved and not communicative? Or does it simply mean they prefer to stay to themselves? Does it mean this is their title in the armed services? I have this label on one of the doors of my office. It is meant that I don’t conduct business in this room. It is reserved for working on files, talking on the phone, and doing computer work. There are also areas for people to engage in conversation so this is only a small part of the office that I reserve. On social networking often people will keep their sites for a select few and make it by membership only. Sometimes there are private country clubs or associations that are for members of a specific industry. We all belong to families and some are more open than others. Big families tend to be that way. They are as a group more private and have their own code of honor. I was raised by parents who were private people. They taught us not to be nosy about our neighbors. We were taught not to discuss religion, politics, or the amount we made. In affect, they were teaching us social skills about knowing our boundaries with others. We were taught to knock at the door and to step away when someone was on the phone. I still do believe we need stay out of other peoples business unless we are to be of service. Today people freely discuss many things. They talk religion and often try to persuade you of their religion. They dump their political views on one another even when one doesn’t want to know what they think. They intrude into our business and often are just busy being nosy. Now that so many people use their cell phones as their only phone, it is more difficult to stay confidential. Some of these habits are really out of control. Today people take calls here, there, and everywhere. They don’t seem to care who hears them. One day while I was on a train going downtown Chicago, I learned too much about one of the passengers, who went on and on while she was on the phone. After awhile I could see she was annoying everyone around her. I felt she was being too public, as well as, rude. It is good; however, to be inquisitive. It is when we ask questions that we become clearer about our own needs and values. We tell children to ask questions so they can learn. I have thought about this a lot with the many dangers in the world at large. We do need to be vigilant and aware of happenings around us. What was safe years ago isn’t the case in this day and age. So as a mother and grandmother, I think we have a duty to teach our children boundaries that will keep them safe. Do you agree? Think about how to implement these safeguards. Are you setting a good example or acting like the lady on the train? Are there neighborhood watches around you? Is school involvement a way to be on top of things in your own area? Hope this helps keep you and your loved ones safe and still able to “Delight in Living!” Have a great week! Feel free to sign up on our site for future PDF’s and helpful hints.